I have written before about my love for Boca Grande – a “secret” getaway on Gasparilla Island, off the coast of southern Florida.The posh, low-key resort community is the most charming and “old Florida” island town, reminiscent of a bygone era. Click here to read about Boca Grande’s Gasparilla Inn, decorated by Celerie Kemble’s mother, Mimi McMakin. 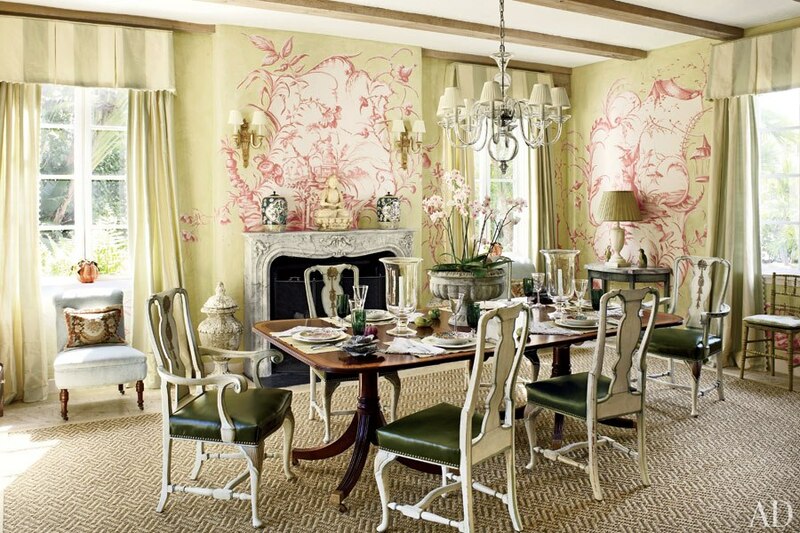 Today we will tour the home of Nancy and Bill Morton, as featured in the November issue of Architectural Digest. 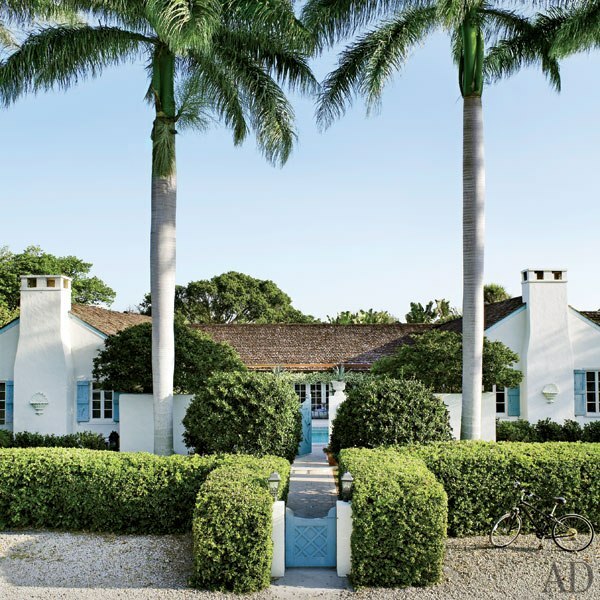 The four-bedroom villa house has been in the family since it was built in 1940 by society architect F. Burrall Hoffman Jr. Hoffman is known for creating several domestic showplaces of the early 20th century, notably Miami’s Vizcaya and Palm Beach’s Villa Artemis. 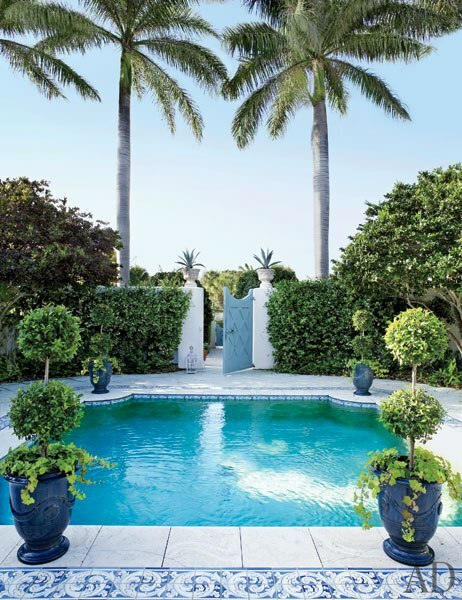 Bill’s uncle, a Harvard professor,commissioned the one-story dwelling to escape Boston’s frigid winters.The Mortons were married at the home in 1984, and a few years later they inherited the property and decided to move in.Then the improvements began, led by Nancy who is the president of Ginger Lily, a Boca Grande interior design firm. 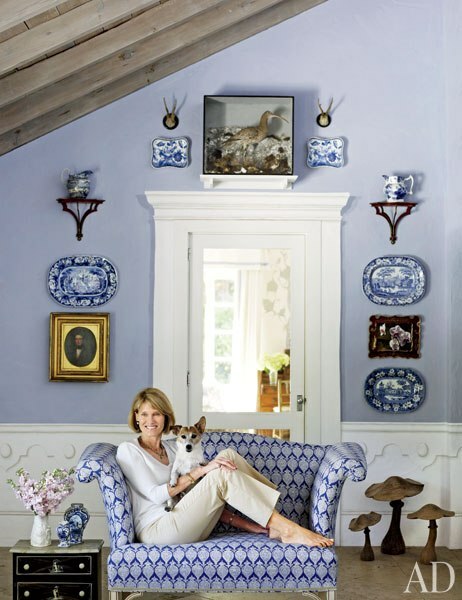 Nancy Morton relaxes in the loggia of the Boca Grande, Florida, residence she shares with her husband, Bill, and Jack Russell terrier, Rupert. The house was designed in 1940 by architect F. Burrall Hoffman Jr. 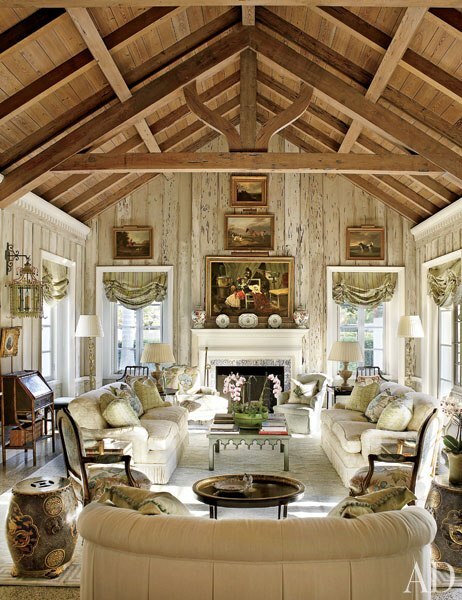 The living room’s pecky-cypress paneling was lightened by decorative painter Bob Christian, whose work can also be seen on the tile fireplace surround. The landscape paintings are 19th-century English, the roll-arm sofas are by O. Henry House, and the Louis XV–style armchairs by Edward Ferrell + Lewis Mittman, in the foreground, are upholstered in a Brunschwig & Filsfloral; Chinese rice barrels serve as occasional tables. In the living room, a Portuguese chest-on-stand is positioned beneath an antique English painting of dogs; the Aubusson is by Stark. Glassed in to become a combination entrance hall and living area, the cypress-beamed loggia is paved with travertine by Country Floors. The walls feature trompe l’oeil decoration by Christian and an array of Staffordshire plates and platters. The faux-bamboo lantern fixture, -tier occasional table, and button-tufted armchair are from John Rosselli, and a Lee Jofa ikat stripe covers a pair of scroll-back chairs by O. Henry House. Chinoiserie scenes by 18th-century French artist Jean-Baptiste Pillement inspired Christian’s murals in the dining room, a space added by the Mortons; the artist also painted the Georgian-style dining chairs and marbleized the mantel. Hurricane candleholders by Simon Pearce are displayed on the double-pedestal table; the sisal is by Stark. 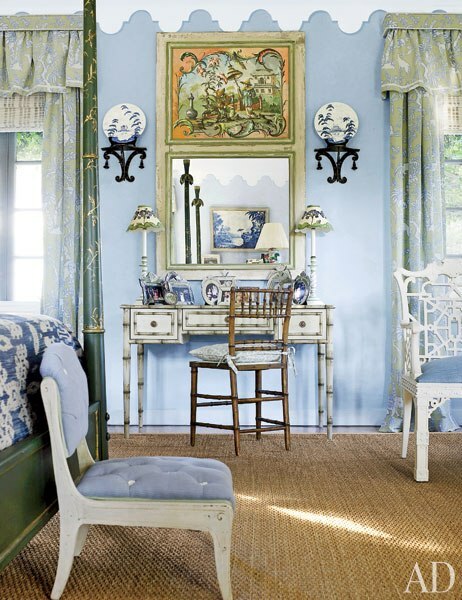 Painted furniture and a blue, white, and green palette freshen the master bedroom. Brackets from John Rosselli hang above a Louis J. Solomon faux-bamboo desk with custom-painted decoration by Christian; the curtain fabric is by Brunschwig & Fils, a Clarence House stripe covers the slipper chair, and the sea-grass carpet is by Stark. 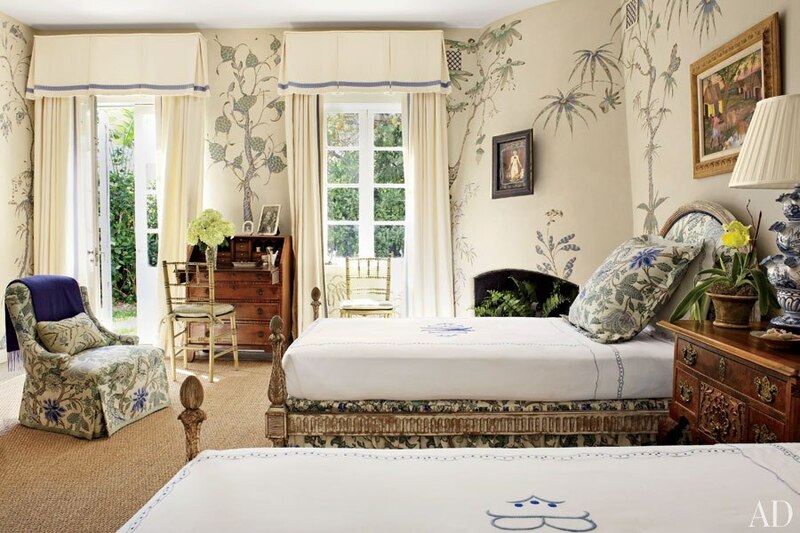 Murals of fantastical plants ornament a guest room; a Manuel Canovas print from Cowtan & Tout is used on the beds and the armchair. A miscellany of furniture styles lends an heirloom atmosphere to another guest room. A plunge pool centers the front courtyard; the ceramic tiles and travertine pavers are by Country Floors. 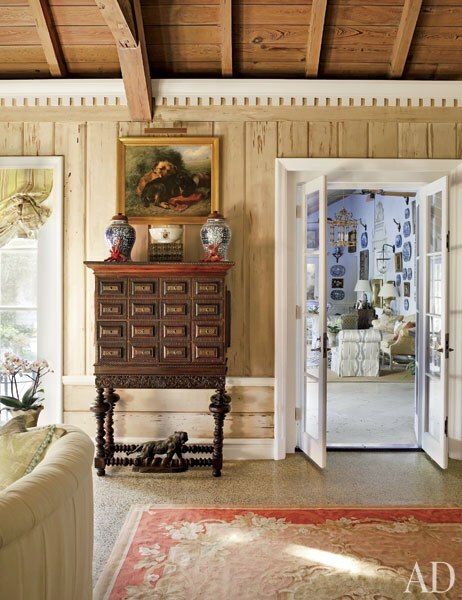 Click here to read Architectural Digest’s full report on this “Light and Lively Gulf Coast Home.” All images and captions are from Architectural Digest. 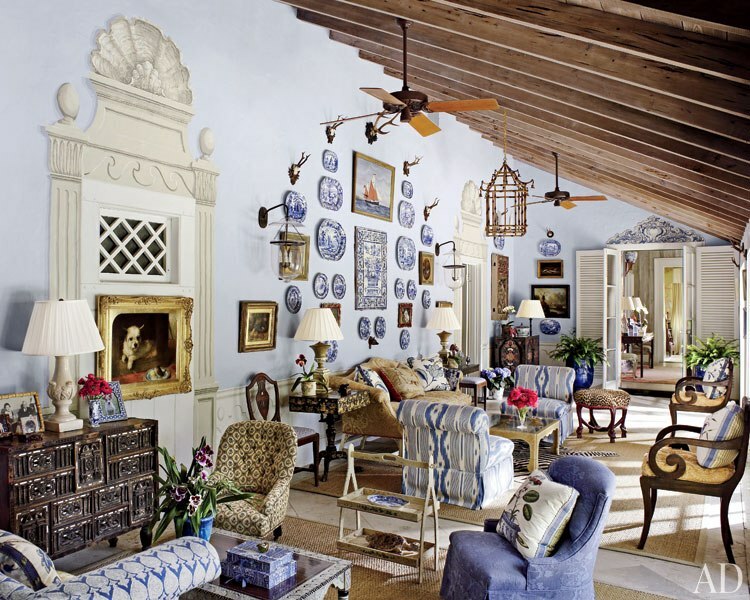 Doesn't get any chicer than Boca Grande…terrific blue story on this post. I sell more blue and white pillows and when I see them used in fabulous interiors like this home I can see why. The outside of this home and the pool are my idea of perfect Florida living!